(FinalCall.com) - January 12, 2010 at 4:53 p.m., a life-changing moment forever etched in the hearts, minds and souls of the people living in a small yet mighty island nation, nestled in the Caribbean. The world watched in shock and horror as the first images and reports surfaced about the devastating 7.0 magnitude earthquake that struck Haiti, the world's first Black republic. The capital city, Port-au-Prince, crumbled to the ground in a country already hurting as the poorest nation in the Western Hemisphere, the result of years of U.S., UN and European-led interference, occupation and influence, say many. The international community responded immediately as aid and promises of assistance poured in from all over the world. Over 50 countries initially pledged an excess of $8.75 billion in humanitarian aid but less than 15 percent ($686 million) of that has arrived. Where is the money and the progress? 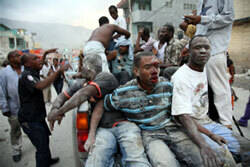 Injured Haitians on a truck headed for medical aid one year ago. “The fact that nearly half of the donated dollars still sit in the bank accounts of the relief-aid groups does not match the urgency of their own fundraising and marketing efforts of donors' intentions, nor does it convey the urgency of the situation on the ground,” said Ben Smilowitz, executive director of the Disaster Accountability Project. “It may be a disincentive for future giving by individuals and other governments,” he added. Besides the thousands of charity groups in the country, two major forces, the Red Cross and the United Nations peacekeepers, have also come under fire. The Friday Haiti Relief Coalition based in New York has been protesting for months against the American Red Cross and other non-profits for holding on to millions in donations collected for Haitian relief efforts. According to the Disaster Accountability Project's One Year Report On The Transparency of Relief Organizations Responding to the 2010 Haiti Earthquake, the American Red Cross has raised $479 million for relief and recovery but is on track to spend only $245 million by Jan. 12. The Friday Haiti Relief Coalition contends with so many people still living in tents and suffering from cholera, holding on to millions of dollars is wrong. “These facts are unacceptable so we must lean on the various organizations that raised millions of dollars for the Haitian people,” posted the group on its Facebook page. “No amount of excuses, however complicated and bureaucratic can mask this brand of blatant, criminal negligence. With resources come responsibility and the inaction of the ARC and other foreign NGOs is tantamount to genocide,” Gregory Perry of the Friday Haiti Relief Coalition told an online news outlet. Between 1.5 to 1.7 million Haitians are still homeless with little or no access to medical care, food and clean water. And, the worst cholera epidemic in 100 years effecting over 122,000 people, leaving over 2600 dead and counting, has many activists angry and upset. Though aid money has been released, it has been exceedingly slow in getting to where it needs to get to help. Analysts say only 15 percent of temporary housing has been constructed and very few permanent water and sanitation facilities have been built. The enormous amount of rubble left is being slowly removed. According to Thomas Adams, U.S. State Department special coordinator for Haiti, 2 million cubic meters of rubble has been removed. Critics say this is less than 5 percent. Estimates on the amount of rubble remaining range from 12 to 19 million cubic meters. Depending on certain conditions and implementation of a more effective system of removal, the goal is that by Oct. 2012, another 4 million cubic meters can be removed, said Mr. Adams. “The hope is that the following year, year and a half the rest could be removed, that's pretty ambitious and again it depends on a lot of conditions being met,” said Mr. Thomas on a Jan. 10 media conference call. Mr. Thomas also contends that not all of the money pledged from public sector donors for recovery was to be spent in one year and that the pledges for 2010 were approximately $2.1 billion and 63.6 percent ($1.28 billion) of that has been dispersed. However, that does not mean the money has been spent on the ground, only that the money has been obligated to a contractor or to a nongovernmental organization, he continued. Haitians in the Diaspora have complained that they have been largely left out of the rebuilding, reconstruction and repair process as well as the decision making process. “The earthquake only devastated more of an area but the entire island of Haiti is devastated,” said Carmella S. Muhammad, whose parents are from Haiti. The Chicago entrepreneur, fluent in French and Creole, has several relatives still in Haiti. She communicates with family members by telephone and goes online for updates. Her cousins in Port-au-Prince are in the same condition they were the day of the earthquake, she said, thankful relatives outside of the capital city have been able to offer some shelter. A report released Jan. 6 by Oxfam, an international relief and development organization blamed the lack of progress on a combination of Haitian government indecision, rich donor countries' pursuit of their own aid priorities and a lackluster Interim Haiti Recovery Commission. The voices of poor Haitians are seldom heard in the policy-making process that directly affects their lives, noted the report. Haitian authorities, along with the international community, should consult, communicate and involve the Haitian people in national reconstruction plans and programs, it continued. ‘Republic of NGOs' usurps Haiti's government? “Too many donors from rich countries have pursued their own aid priorities and have not effectively coordinated among themselves or worked with the Haitian government. This seriously weakens the government's ability to plan and deliver on its sovereign responsibility—to lead reconstruction,” said Roland Van Hauwermeiren, country director for Oxfam in Haiti Jan. 6. Oxfam itself is an NGO in Haiti. Maura Hart, humanitarian press officer for Oxfam, admits that there has not been a lot of coordination, joint decision making and input with Haitian organizations on the ground and elsewhere, which may be part of the problem, she said. Asked how many of the thousands of groups in the country are actually run by Haitians, Ms. Hart did not have an exact figure. But, she said, about 90 percent of Oxfam's staff is Haitian. Not only is monetary aid a problem, but disorganization, bureaucracy and confusion among the non-profit and relief groups entrenched in Haiti has caused a logjam in aid distribution. The Haitian people appear caught in the middle between groups focused on immediate aid versus those focused on long term rebuilding efforts. Also, while U.S. and other groups are receiving contracts to rebuild, Haitian-owned and operated businesses are relying on receiving sub-contracting work from these larger groups—or getting very little else. The U.S. Agency for International Development gives only $1.60 to Haitian-owned businesses for every $100 spent on contracts. According to the Associated Press, Haitian companies have received $4.3 million, or 20 percent, of contracts totaling $267 million through 2010. USAID's inspector general found that 70 percent of funds given to the two largest U.S. contractors for the cash for work program was spent on equipment and materials. So just 8,000 Haitians a day were being hired for temporary jobs, instead the 25,000-person-a-day target, said the Associated Press. One quarter of contracts went to U.S. firms with Haitians having no chance to bid, while requests for Haitian subcontractors are often written in English only, meaning little access to most Haitians who speak kreyol, the Associated Press reported. Inside the United Nations, there were reports of bureaucratic infighting over who would handle money earmarked for Haiti. As the infighting raged, aid simply stalled. The already tenuous relationship with the United Nations snapped with a cholera outbreak that some outsiders and most Haitians believe originated from unsanitary conditions at a peacekeepers camp. The water borne illness, which causes dehydration, diarrhea, has been fatal, killing upwards of 2,600 people and leaving another 150,000 or more infected. It was unseemly to many that Haitians were dying because they could not get clean water. “There is no excuse for the cholera epidemic and deteriorating conditions on the ground given the amount of resources donated and available. With hundreds of millions in the bank and unspent, many groups continue to solicit additional donations,” observed Ben Smilowitz of the Disaster Accountability Project. Dr. Ron Daniels, president of the Institute of the Black World 21st Century and founder of the Haiti Support Project, has led several delegations to Haiti since the earthquake. Small steps have been made, he said. A failure to engage Haitian organizations on the ground in the beginning was a concern and, to some extent, still is. “If you're going to help a country you need to work with the people who you're providing help for,” Dr. Daniels told The Final Call. Haitians, he continued, know the best methods on how to coordinate efforts of getting aid to the people. According to the website for the United States Institute of Peace, there are at least 3,000 charitable, advocacy, relief or not for profit groups operating in Haiti. Dr. Daniels said some 10,000 to 14,000 groups, with their own programs and fundraising, are not coordinated with each other or the Haitian government. Fewer than 500 of these groups registered with the Haitian government and it adds to the chaos, he said. The Clinton Bush Haiti Fund has awarded grants to groups pledging to help in long-term rebuilding and reconstruction efforts and states their goal is for Haitians to lead the way. “We go with Haitian NGOs whenever we can and partner with Haitian NGOs whenever we can,” said Meg Pearce, vice-president of marketing and communications for the foundation. “Wherever you have poor people you have a bunch of agencies that are supposed to be healing our ills but they never do,” said Mr. Jean-Baptiste, an elected official in Evanston, Ill. The sentiment among many Haitians and Haitian Americans after the earthquake is any infusion of capital to provide services to the people should be used to support local businessmen and farmers which would build power in Haiti, he said. The fight for inclusion by Haitian and Haitians in the Diaspora on decision making in their home country has been an historical fight that has not changed, Mr. Jean-Baptiste told The Final Call. It continues to be a paternalistic type of relationship, he said. What analysts may be saying is one thing but those who get the contracts to go and implement things are not Haitian, said Mr. Jean-Baptist. “They're established companies that have had a history of coming in and a significant portion of their money is for administrative overhead,” he added. A partnership with existing Haitian institutions and government is needed, argued Mr. Jean-Baptiste.